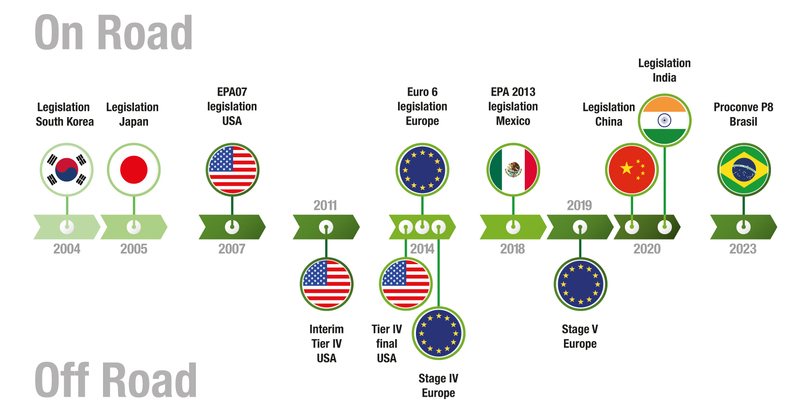 Since the 1990s, significant improvement in emission levels has been achieved, mostly due to emission-conscious engine design. This technical development, combined with recent years’ legislation, aims to lower the overall emissions from engines. The legislation for treatment of crankcase emissions started with Closed Crankcase Ventilation (CCV) in Korea 2004 and was followed by CCV in Japan 2005. In 2007, the USA introduced legislation allowing both Open Crankcase Ventilation (OCV) and CCV and was swiftly followed by Europe in 2014. China and India are scheduled for the implementation of nationwide CCV legislation in 2020. To further improve emissions from diesel engines, new rules and regulations are being introduced or refined. With an Alfdex® oil mist separator you can count on being able to adhere to emission standards for many years to come. Read more about rules and regulations at dieselnet.com.